Learn Exquisite Rajasthani Dal Dhokli Recipe- Whole Wheat Flour Dumplings Cooked With Seasoned Lentils recipe with simple step by step photos. 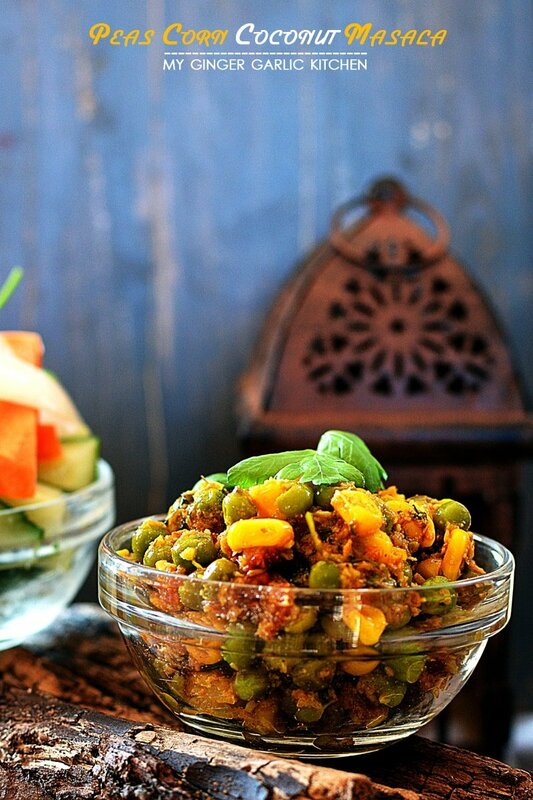 This is one of the most famous & traditional rajasthani dishes. Dal Dhokli is a spicy, satisfying, and sumptuous one pot meal made by boiling lightly spiced wheat flour dumplings in a lentil base. Then for a final touch a spicy tempering is added to this cooked dal dhokli. The Rajasthani version of Dal Dhokli slightly differs from Gujarati Dal Dhokli. Gujarati Dal Dhokli is lightly spicy, tangy and sweet. Where Rajasthani Dal Dhokli is a lot spicier than the Gujarati version of Dal Dhokli. And no sweetener is added to the authentic Rajasthani Dal Dhokli recipe. In Gujarati Dal, Dhokli Spiced whole wheat flour dough is first rolled into a chapati or flatbread and then cut into diamond shape. In contrast, Rajasthani dal dhokli dumplings are shaped into small discs using hands. Gujarati style dal dhokli has peanuts, but peanuts are not added to Rajasthani dal dhokli. 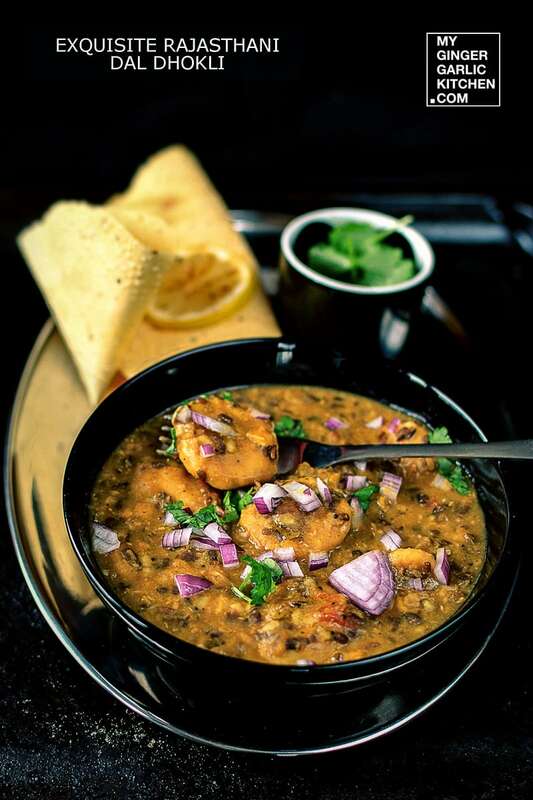 Gujarati Dal Dhokli is made with ‘Split Pigeon Pea’ aka Toor/Arhar Dal, and lesser spicy. Whereas, in Rajasthan, there are a couple of versions of dal dhokli. 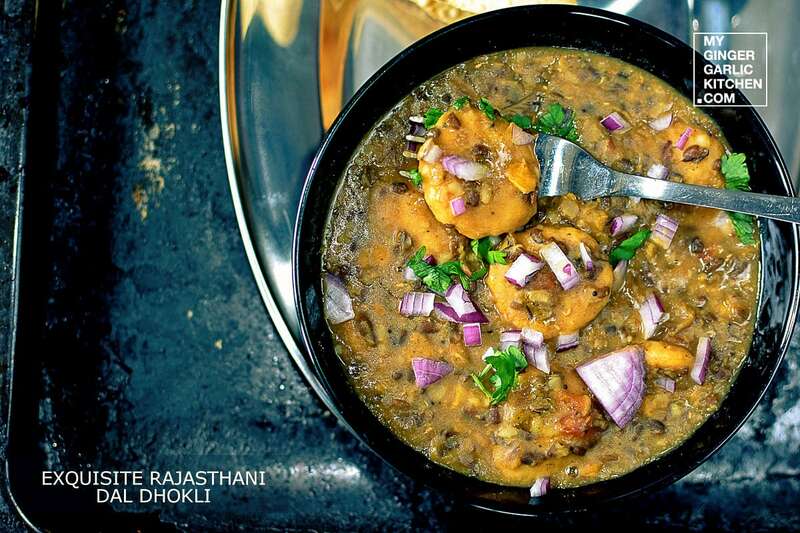 Some people in Rajasthan use ‘Split Black Gram’ aka ‘Urad Dal’, while others use ‘Split Green Gram’ aka ‘Moong Dal’. Some people also use the combination of Urad and ‘Chana Dal’ (Split Chickpea) or a combination of Urad dal + Chana Dal + Moong Dal. Is dal dhokli a complete meal? 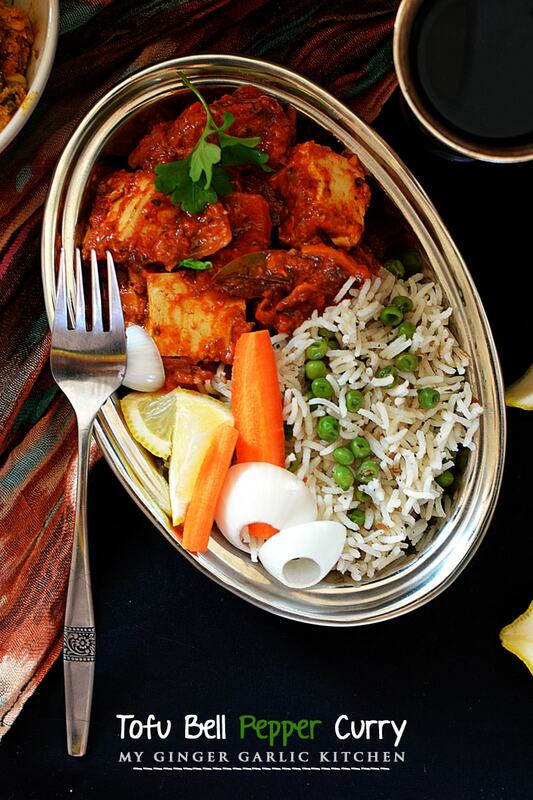 Yes, it is an entire Indian meal made in one-pot, which you can relish as it is. Making this wholesome meal ‘Dal Dhokli’ is very simple and easy to cook. And it takes very little time and effort in cooking. How long can I keep Dal Dhokli (Indian style pasta)? Dal Dhokli will stay fresh for 2 days in the refrigerator. Just heat it up right before serving. Can you freeze dhokli? Can dhokli be made in advance? Yes, they can be made in advance if you are planning to freeze them. Your freshly made dhokli can last up to 4 weeks in the in the freezer. Shape the dhoklis and sprinkle them with dry flour. Arrange them separately on a sheet pan or a freezer safe plate and freeze for 1-2 hours. When frozen you can transfer them into some freezer safe Ziploc bags or freezer friendly container and freeze. Thaw them at room temperature for 1 hour before adding to the boiled dal. Nevertheless, last weekend, I made this hearty and soothing dish of ‘Rajasthani Dal Dhokli’ on my hubby dear’s request. His desire was to make his Mom’s recipe of ‘Dal Dhokli’. My Mom usually makes Rajasthani Dal Dhokli with Moong dal, or with all the three dhals/dals which I have mentioned above. While, my Mom-in-law makes dal dhokli only with the combination of ‘Urad Dal’, Moong Dal, and ‘Chana Dal’. And believe me, this ‘Dal Dhokli’ is one of her best recipes. Whenever I visit India, I make sure that she cooks her traditional ‘ Dal Dhokli at least a couple of times’. I have eaten almost all types of Dal Dhokli, but believe me, her ‘Dal Dhokli’ recipe is the yummiest. And that’s why I have named it ‘Exquisite Rajasthani Dal Dhokli’. Sharing my Mom-in-law’s recipe was long due. And thankfully, hubby dear’s request finally gave me a chance to share it here. Exquisite Rajasthani Dal Dhokli is one of the most famous & traditional Rajasthani dishes generally prepared and enjoyed in cold weather. This is a satisfying one-pot meal where spiced whole wheat dumplings are boiled in lentils until cooked. You can call it an Indian Style Pasta. 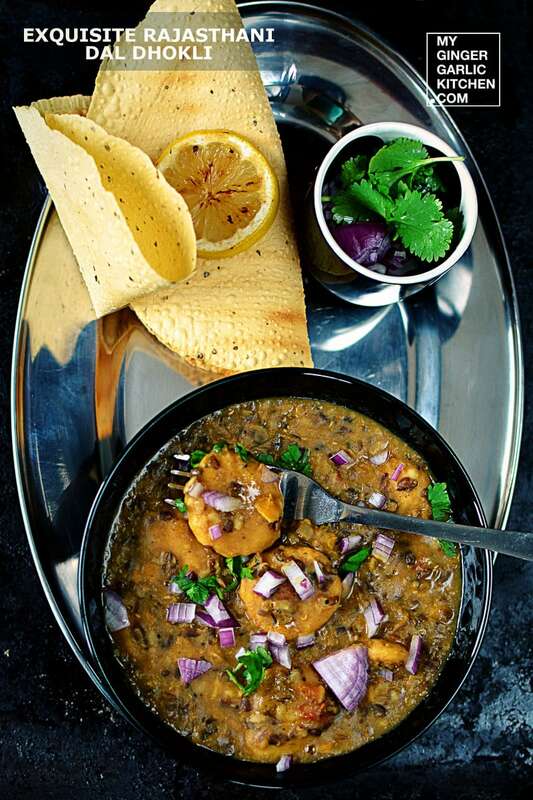 This Rajasthani Dal Dhokli is a mouth-watering Indian exquisiteness from the royal of Rajasthan. This is so full of healthy nutrients we need in a meal. Because this is made with spiced dough dumpling which is cooked in lentils until cooked through. It is then seasoned with spicy onion and tomato masala. Clearly these spices enhance its fragrance and flavor. 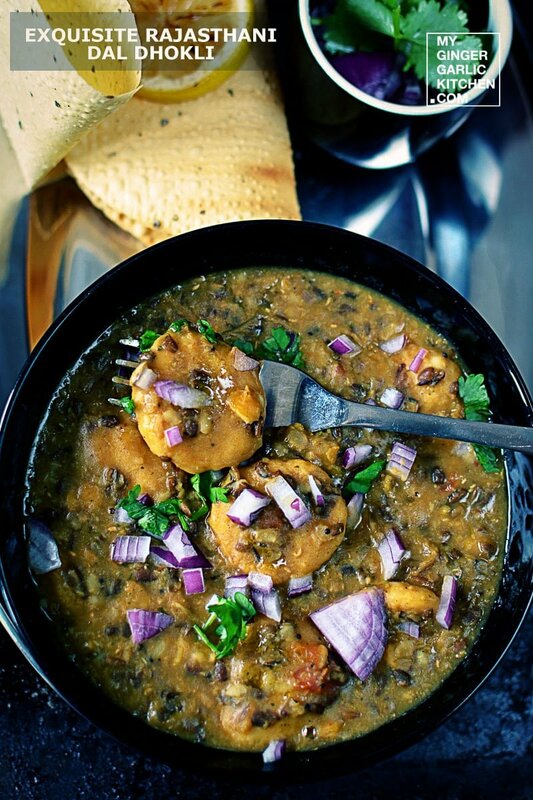 This Rajasthani dal dhokli is spicy, flavorsome, delicious one-pot meal. This quick, simple and easy one pot meal is best served hot with papad. The serving of Papad makes this even tastier. The good thing about this scrumptious and fuller one-pot meal of Dal Dhokli is that it can be made in a jiffy. And it keeps you full for a long time. 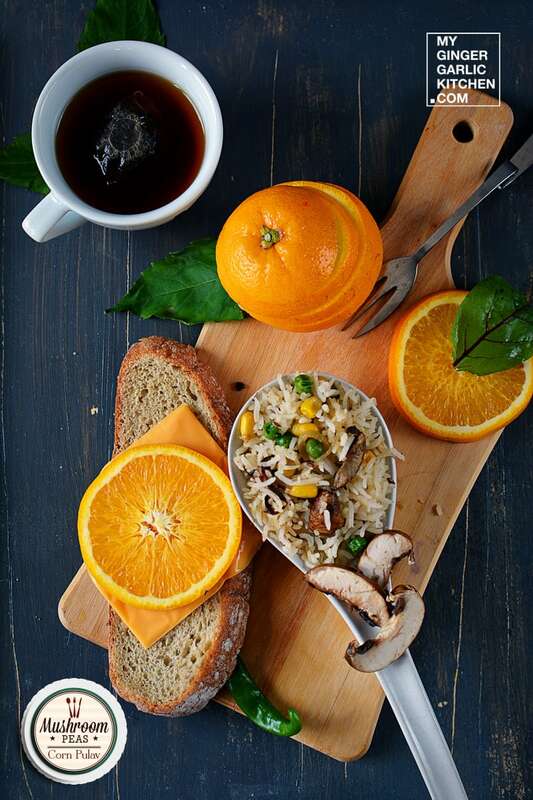 This simply means that you won’t feel hunger pangs every other hour. 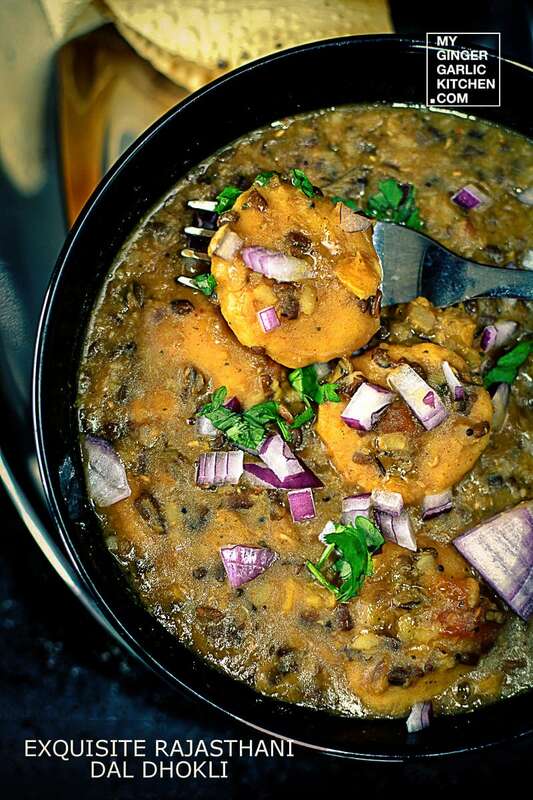 When to cook Dal Dhokli? Sometimes I make it for dinner when I have friends coming over a short notice, and I don’t have any fancy ingredients in my fridge. This meal is such a time saver and everyone loves it to the core. Please do make it for your friends and family. This dish will surely get many eyeballs. 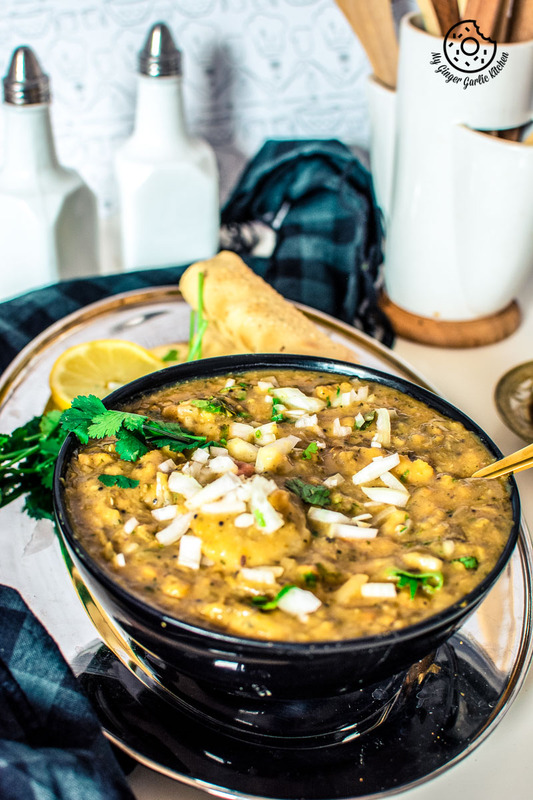 Can I make Rajasthani Dal Dhokli in an Instant Pot? Yes, you can. For making dal dhokli in an instant pot. You start by making Dumplings/Dhokli First. Take a mixing bowl. Add all the dhokli ingredients except yogurt to the mixing bowl. Mix well, and add yogurt to make a stiff and smooth dough. Add some water if needed. Divide the dough to make marble sized balls, and press them like a disc. Spread them in a plate separately. And set aside. Switch on the instant pot. Heat oil. Add mustard and cumin seeds to it. When they start to splutter, add chopped onion, and saute for about 3-4 minutes or till it turns pink. Add chopped, green chilies, shredded ginger-garlic, and cook for 2-3 minutes. Add chili powder, coriander powder, and garam masala powder along with ¼ cup of water. Let the spices cook with water for a few minutes. Wash Bengal gram and black gram. Add dal along with turmeric powder, chopped tomatoes, salt, and 4 cups of water. Cover lightly and let it come to boil. Add dough balls to the boiling dal one by one. Close the lid and pressure cook. Dal Dhokli is ready. Can I add Dhokli to dal when water is cold? Unfortunately no. Treat dhokil (dough balls) as a freshly homemade pasta. You’ll first have to let the dal come to a boil first. If you’ll add dhoklis to the cold water, the dough balls will become clumpy. 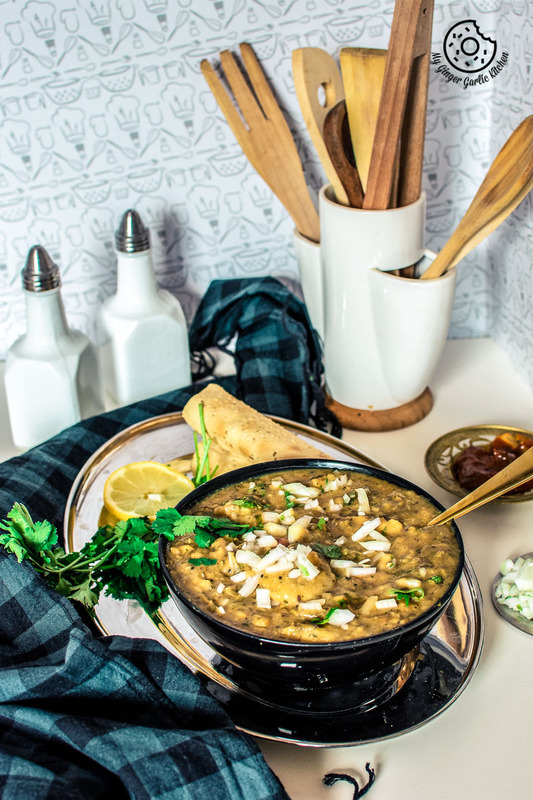 How do we eat Rajasthani Dal Dhokli? Dal Dhokli is best served warm or piping hot. You can also have it at room temperature. Top with chopped onions, a sprinkle of freshly squeezed lemon juice and Finally drizzle some ghee on top. Serve along with some roasted papad. Yes, any type of Dal Dhokli healthy because it has a lot of lentils which are rich in protein. 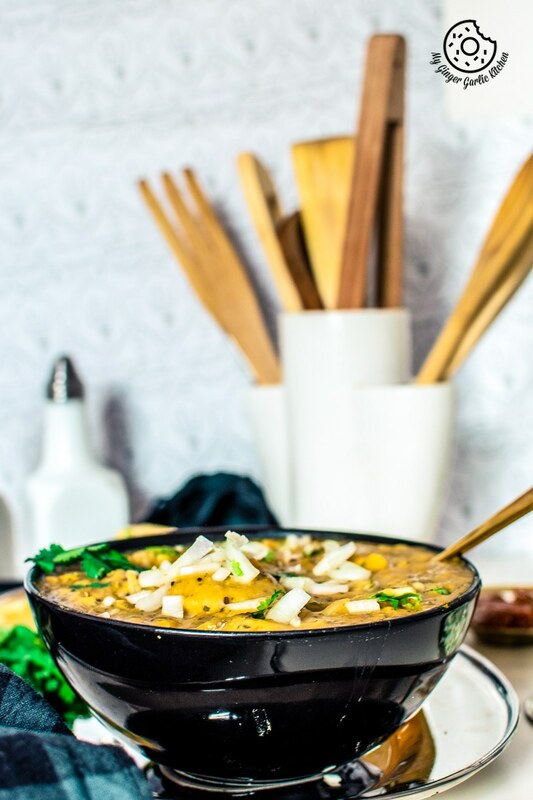 Gujarati Dal Dhokli is vegan. However, Rajasthani Dal Dhokli is not vegan, because it has some yogurt in the dough. But you can replace dairy yogurt with soy yogurt or any other vegan substitute. So, let’s not keep you waiting, try this authentic Dal Dhokli recipe this weekend without fail and while you are enjoying the same with your loved ones, do not forget to drop your love through your comments! How Do I Make Rajasthani Dal Dhokli? Given below is a step by step picture and video tutorial of making of the dhoklis aka dumplings and dal and tempering the day.So follow my step-by-step instructions with pictures, and learn to cook Exquisite Rajasthani Dal Dhokli in easy to understand quick steps. Divide the dough to make marble sized balls, and press them like a disc. Spread them in a plate separately. Wash Bengal gram and black gram. Add to the pressure cooker along with turmeric powder, chopped tomatoes, salt, and 4 cups of water. Let them come to boil. Add dough balls to the boiling dal one by one. Cover the lid, and pressure cook dal with dough balls for 7-8 whistles. Remove from heat. When the cooker has cooled off, open it. Heat oil in a pan. Add mustard and cumin seeds to it. Let the spices cook with water for few minutes. Now add tempering to the cooked dal, and mix well. Cook on medium heat for 2 minutes. Remove from heat. Transfer dal dhokli to the serving bowl. Top with lemon juice, chopped onions and coriander leaves. 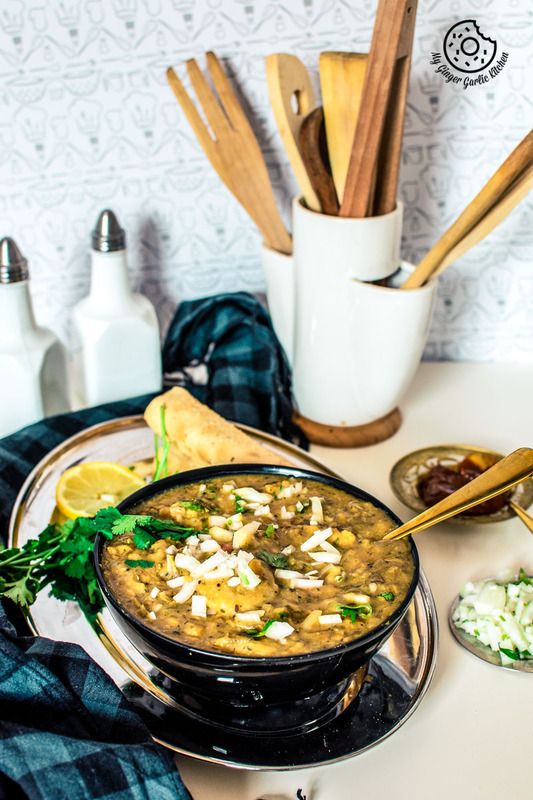 Exquisite Rajasthani Dal Dhokli Recipe – Whole Wheat Flour Dumplings Cooked With Seasoned Lentils is one of the most famous & traditional Rajasthani dishes. This is a satisfying one-pot meal where spiced whole wheat dumplings are boiled in lentils until cooked through. 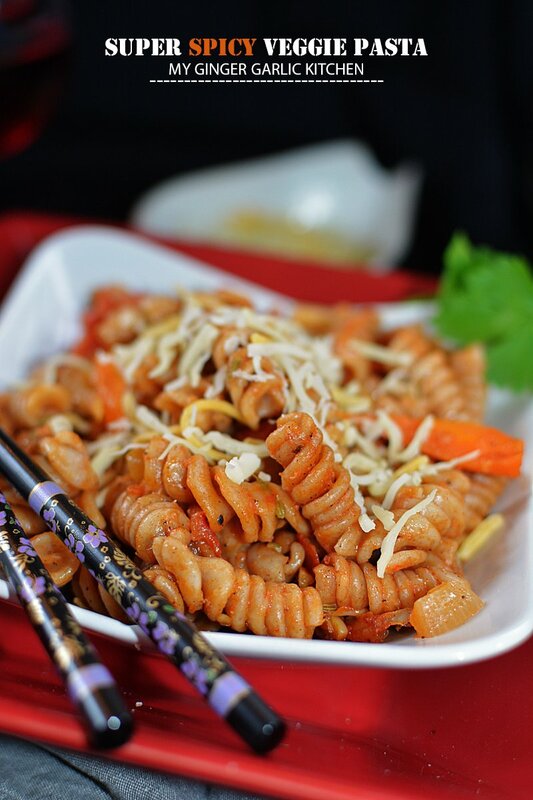 You can call it an Indian Style Pasta. 1. Take a mixing bowl. Add all the dhokli ingredients except yogurt to the mixing bowl. 2. Mix well, and add yogurt to make a stiff and smooth dough. Add some water if needed. 3. Divide the dough to make marble sized balls, and press them like a disc. Spread them on a plate separately. 1. Combine Bengal gram green gram, and black gram and rinse them well. 2. Add washed dals to the pressure cooker along with turmeric powder, 1 1/2 chopped tomatoes, 1 tsp salt, and 4 cups of water. 4. Add dough balls to the boiling dal one by one. 5. Cover the lid, and pressure cook dal with dough balls for 7-8 whistles. 6. Remove from heat. When the cooker has cooled off, open the lid and keep it aside. 1. Heat oil in a pan. Add mustard and cumin seeds to it. 2. When they start to splutter, add chopped onion, and saute for about 3-4 minutes or till it turns pink. 3. Add shredded ginger-garlic, and cook for 2-3 minutes. 4. Add salt to taste and sauté for another minute. 5. Add 1/2 chopped tomato, green chilies and mix well. Cook for 2 minutes. 6. Now add the chili powder, coriander powder, along with 1/2 cup of water. 7. Let the spices cook with water for a few minutes. 8. Now add tempering to the cooked dal, and mix well. 9. Add and garam masala powder and kasuri methi and mix well. 10. Let it come to a boil, and then cook on medium heat for 2 minutes. Remove from heat. 1. Transfer dal dhokli to the serving bowl. 2. Drizzle with 1 tbsp ghee and some lemon juice. 3. 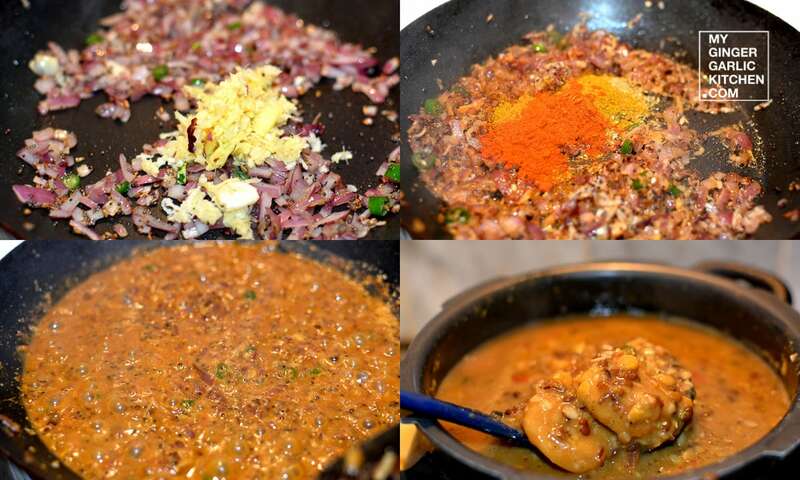 Topped with chopped onions and coriander leaves. 1. 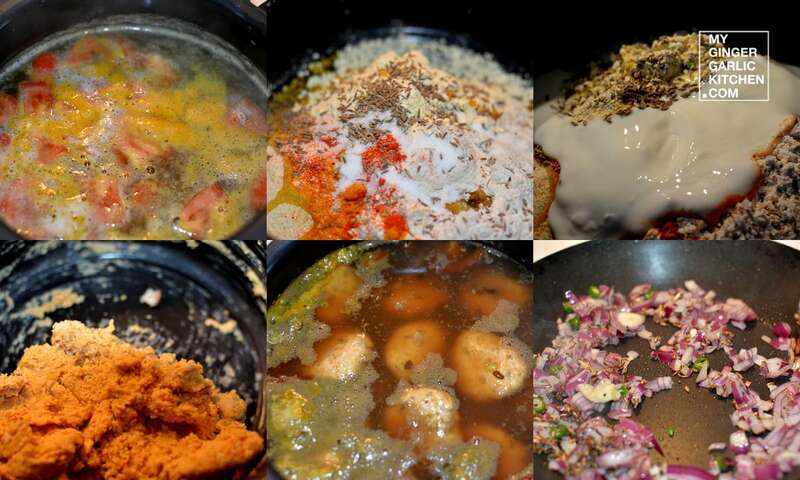 Boil the Dal before adding the dhoklis otherwise, the dough balls might become clumpy. 2. To make dal dhokli richer, you can also use ghee/butter instead of oil. 3. Feel free to reduce the amount of chili powder, if you think that’s too hot for your taste.